Air Lift Company has developed dependable air spring suspension products since our inception in 1949. The original Air Lift product, a rubber air spring inserted into a car’s factory coil spring, was created and patented in 1950. We’ve come a long way since 1949 and are proud to be a dedicated suspension specialist company. 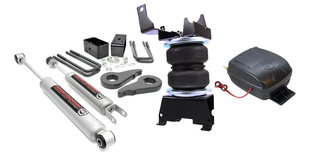 Air Lift leads the industry in no-drill suspension applications – kits that simply bolt onto your vehicle’s frame, greatly speeding up the installation process. Our teams work constantly to bring innovative products to you and upgrade existing products with the latest technology.